Ideally, your gum tissue should fit tightly around your teeth. However, certain problems such as periodontal disease can destroy supporting tissue and bone, eventually forming pockets around the teeth, which become deeper over time and turn into a breeding ground for bacteria. There are other gum issues that may arise as well, such as an uneven gum line, or an overly “gummy” smile, teeth that are too long or exposed due to gum recession, and also indentations in the gums and jaw bones. Whatever your reason for seeking gum surgery – whether due to gum issues or purely aesthetic reasons – Tribeca Advanced Dentistry is your trusted source for gum surgery in NYC and will help you accomplish your goals. If your teeth appear too long or too short when you smile, it could be because your gums either cover too much of your teeth or not enough. 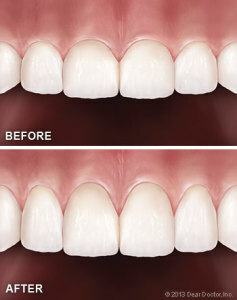 In these cases, we provide gum surgery to correct the problem. For short teeth, we will remove excess gum tissue to expose more of the tooth and then sculpt your gum line to give your smile the perfect look. On the other end of the spectrum – for long teeth – we will use gum graft surgery and other root coverage techniques to reduce more gum recession and protect vulnerable roots from any kind of decay. If you have lost teeth, this can cause an indentation in your gums and jawbone where the tooth used to reside. This occurs when the jawbone recedes due to the fact that it is no longer holding the tooth in place. This creates an unnatural looking indentation and may cause the replacement tooth to look long compared to the other adjacent teeth. This type of gum surgery is called ridge augmentation and can fill in the defect and recapture the natural contour of the gums and jaw. At our Tribeca office in New York, we use the latest diode laser from BIOLASE. This allows us to provide soft tissue surgery, whitening, and pain therapy by using a technologically advanced touchscreen interface. Because we use laser surgery, there is minimal discomfort compared with other more conventional methods as well as less irritation and bleeding. Lasers are integral aspects of modern medical and dental procedure. They are able to expertly cut through the hard and soft tissues of the gums without any heat, vibration, or uncomfortable pressure. This makes lasers an excellent option for patients, especially considering they eliminate most of the pain, bleeding, and post-operative swelling that typically occur with more traditional surgical methods. We typically perform laser surgeries for gums, which involves minimal discomfort compared to other more conventional methods of gum surgery. Because the laser removes infectious tissue, it also detoxes the area so that patients heal faster. Our laser also allows us to perform scaling and root planning to remove plaque deposits and tartar from below the gum line while smoothing the tooth’s surface so that it is more difficult for plaque to build up in the future. Periodontal disease eats away at the bone and gum tissue surrounding the teeth. Over time, this causes pockets to form, which in turn become breeding grounds for bacteria. Even if your oral hygiene routine is impeccable, these pockets can become impossible for you to clean on your own. Using laser treatment, we can remove bacteria, reduce the depth of the pockets, and prevent further damage. If you feel you have an overly “gummy” smile, which you have excessive gum tissue covering a significant amount of tooth structure causing you to have an “unbalanced” smile, we can utilize lasers to reshape the gum tissue and bone to expose more of your teeth. This can be done without the use of needles, blades, or sutures to not only improve your smile but also aid in dental restorations like fillings, crowns or dental implants.